Diesis is the most innovative solution currently available for dispensing cold drinks in both cans and bottles. Its contemporary stylish design is created to guarantee a user-friendly experience with its intuitive interface. 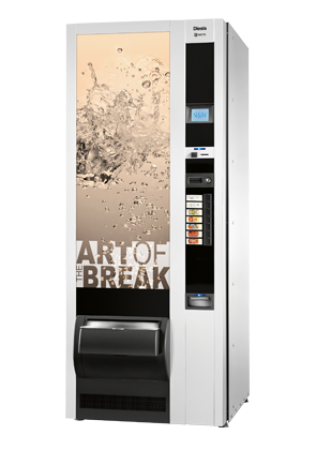 The ease of maintenance helps complete this vending machine, and with its stylish design and elegant aesthetics it is quickly becoming the market’s benchmark for years to come. 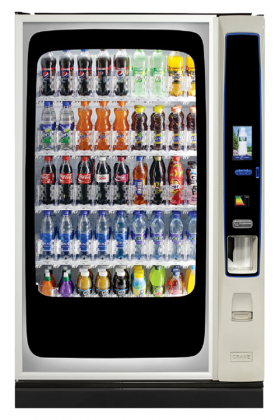 The BevMax MEDIA Touch provides the ultimate cold drink vending experience, offering industry leading technology to help drive sales and consumer satisfaction. The BevMAX 4 is a classic Crane product. Durable and reliable, the machine is available in two model sizes, 35 and 45 selection. 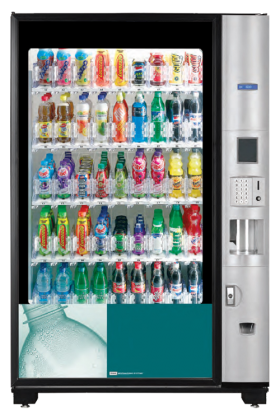 The large illuminated glass front of the BevMAX 4, lit by long-life, low energy LED lighting provides consumers with a clear, unobstructed view of all products available, allowing maximum salves impact. The BevMAX 4 has a self-contained modular refrigeration deck, offering improved performance. This fridge deck can be removed easily from both the back and front of the machine.